Yes, it's Mardi Gras time here on the gulf coast, and you know what that means? It's time to enjoy some KING CAKE!!!! Awhile back, the nice folks over at Sucre Bakery in New Orleans, asked me if I would like to do a review and give away one of their king cakes, boy you bet I do. This week my cake arrived and Mr.CC and I have been enjoying this delicious cake. I have a lot of king cakes in my lifetime and I must say, this one from Sucre, is by far the best one ever. Do you know the story behind the king cake? Well, if not, here is some info that I found over at Sucre's site. Curious how the colorful king cake first came to fruition? The history behind the New Orleans tradition actually dates back to 16th century France during Carnival season. Carnival season starts on Twelfth Night – also called King’s Day – and ends with Mardi Gras. Twelfth Night is traditionally the last night of the Christmas celebration and can fall on January 5th or 6th. Today in New Orleans, most people celebrate it on the 6th. The cake derives its name from the meaning of Kings' Day – which in Christian tradition is the day that the three kings arrived in Bethlehem to visit the baby Jesus . French peasants would share the cake at a Carnival season party. Hidden inside the cake was a bean. Whichever guest found the bean in his piece of cake would be crowned “king” of the party. It was believed that this king would be blessed with new life and good luck in the following year. French colonists brought this tradition to Louisiana where it evolved with the rest of the modern Mardi Gras celebration. New Orleanians love a good king cake, and will take every opportunity to partake – at parties, at the office, at parades, everywhere! Since they are only available for such a short period, these cakes are highly sought after during that time. Today, instead of looking for a bean, you’ll be searching for a small plastic baby trinket, which can be found under or in the kings cake. If you find the baby, you’ll be crowned king – or queen – for the day. This not only ensures your fortune for a year, it also sometimes means you'll receive certain privileges. For example, if the cake is eaten at work, your coworkers might have to treat you to lunch. In some traditions, being crowned king or queen also comes with responsibilities. It means it's your turn to buy the next cake! So, if you would like to WIN a king cake for yourself...enter the giveaway and maybe you will be the lucky winner!!! I like the saying on the shipping box...don't you? They even include some beads with the cake. Oh my...It looks sooooo good! Mine had a purple baby. It was so delicious...trust me on this one. I have always heard of King cakes but have never had one. I did know they had a baby in them. Thanks for sharing! Thank you for sharing with us it look sooo good. Wow! Being new to the south, I am not at all familiar with Mardi Gras traditions. I love the tradition of the king cake and would love the opportunity to win a cake. This is so fun Linda. I have never heard of this. It does look really yummy. Thanks for the chance to win one of these. I have had the King Cake from my grocery store bakery. While it is passable (bless their hearts), I am told that it has no actual comparison to the real King Cake! And I have heard so much about Sucre from a friend in NOLA. Thanks for the contest! This will not be my first but the prettiest for sure! I have been trying to win one of these....I want one so bad! Never heard of them before, but would love to enjoy one. They look delicious. I would LOVE to have a slice of this yummy looking cake! My first King Cake. It looks delicious...and I would share it with the office workers at our Church. This would definitely be my first king cake! Thanks for the opportunity. Mmmmm, never tried this yet and would certainly be happy to try it! Thank you for the opportunity to win a delicious King Cake...I've never had the chance to taste one. I love reading about the tradition, too! 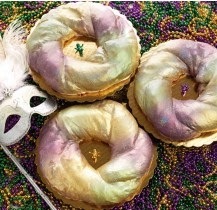 I have never had a King Cake either and would love to try one. The box would be a keeper, I love pretty boxes. My daughter and family vacation at Gulf Shores every year however they have 4 small boys and always rent a ground floor cottage. Wow, Linda, your history of the king's cake helps me understand. I haven't tasted a King's cake but would love to have that experience. I have a tablescape ready to post for Mardi Gras. Great pic of you at your booth. Anyway, thanks for the great giveaway. Please enter me. This would be my first. I have wanted to try one. Visited NOLA for the first time last September and loved it!! Never heard of the King cake. Would love to try one. Thank you so much for the giveaway Linda!!! Yes, this would be my first King Cake. I have never heard of this before. I cannot wait to taste it! Thank you for the opportunity. This would be my first! I have heard yummy things about them from friends. Thank you for the wonderful giveaway. This also would be the first king cake I've had...I'm dying to try one though, Is it coming my way I hope Great Give-A Way. This would be my first one. I would love to try it. They look yummy and fun. I watch a program about the king cakes on Food Network. This would be my first real King Cake. My daughter-in-law made us one last week! That has to be one of the prettiest King Cakes I have every seen. I love King Cakes and the pretty beads too!